What happens after tooth loss? Of course, personal appearance suffers, and self-image, too. Beyond those things, oral health deteriorates as teeth surrounding an empty socket shift, and gums and jawbone recede. What’s the answer? It could be dental implants in Indianapolis. 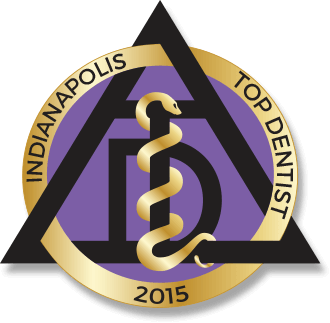 They’re the strongest, most lifelike dental treatments available to replace missing teeth in Indianapolis, particularly when placed by Dr. Mark Farthing or Dr. Armin Tepner of Indianapolis Family Dentistry. The dental implant is artificial tooth which resides right in the jawbone replacing a tooth lost to decay, injury or periodontitis (gum disease). It is made up of three parts: a titanium implant screw, or cylinder, a metal alloy extension post and a lifelike porcelain crown. Put directly into the jawbone during a simple in-office oral surgery, the implant and bone actually adhere to each other as the site heals. This natural process is called osseointegration, and it is reason why dental implants, and many orthopedic joint replacements, feel and function so naturally. Dental implants actually strengthen the jawbone, keeping it dense and sizable. The American Academy of Implant Dentistry states that more than 90 percent of dental implant procedures succeed and that more than 90 percent of these innovative devices stay in place for decades. 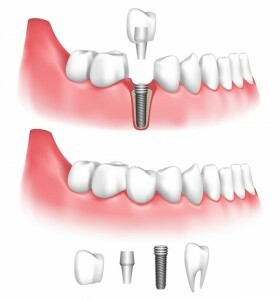 In fact, the dental implant probably is the last tooth replacement a patient will need. That’s quite different from fixed bridgework and traditional partial dentures which need a change out every 10 years or so. Those replacement costs really can add up. A final benefit of dental implants is versatility. Implants can replace one, two or more teeth singly. In addition, dentists can place implants in multiples to support fixed bridgework or fixed or removable dentures. Dr. Farthing and Dr. Tepner are members of a local Implant Study Club umbrellaed by the American Academy of Implant Dentistry. They posses the expertise to evaluate patients to see if they are candidates for dental implants. Plus, they have the skills and technology available to place the implant, post and crown entirely in their offices at Indianapolis Family Dentistry. The dentist examines the patient’s mouth to ensure good oral health and sufficient jaw bone density to accept the implant. Then, the doctor incises the gums, drills a pilot hole and screws the implant device into place. After some weeks of healing, the patient returns to Indianapolis Family Dentistry to receive the post and crown. It’s important not to rush that healing time because the implant must be fully integrated to the bone so it withstands the physical forces of biting and chewing. The patient cares for his or her dental implant by simply brushing twice a day and flossing daily as recommended by the American Dental Association. Twice yearly exams and cleanings are important, too. Patients who smoke should consider quitting because the toxins in cigarettes make implant sites prone to peri-implantitis. This infection resembles periodontitis, or advanced gum disease, in that it destroys gum tissue and bone, often requiring implant removal. Don’t wait. Contact Indianapolis Family Dentistry for a dental implant consult. You’ll learn all about this dental marvel and if you qualify for placement.